Whether threaded dampers of steel, stainless steel or with hardness adjustment, all models are equipped with the sporty twin tube gas pressure technology. And the interior, equipped only with top materials, fulfill maximum requirements, such as the latest piston technology with durable Teflon bearing surface, high temperature oil for stable working performance, hard chrome plated piston rods with optimized surface quality for best protection against external influences. All the LOWTEC dampers are not only equipped with a limitation of the upward stroke (rebound), but with real piston rod shortening. Even in extreme lowering this ensure for spring preload and prevent the destructive touch of the piston rod on the bottom valve. 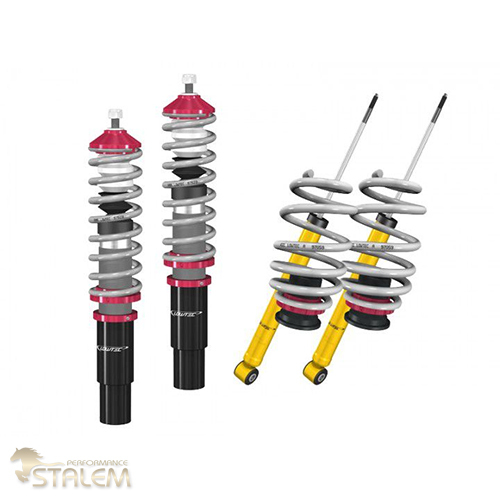 Just like the rebound and compression force of the extremely stable special shock absorbers, the respective spring rates of the special springs are adapted to the different tuned series perfectly. The special springs are manufactured exclusively in Germany/Western Europe and are optimised by complex manufacturing processes. This top quality is standard for each HiLOW kit! 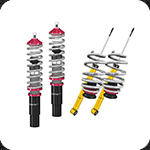 Each coilover is built up in house by trained LOWTEC personnel in selected quality for maximum value and is subject to comprehensive quality control. This all results in reliable and durable suspension systems without compromise. Accessory: pin wrench, hook wrench. Accessory: pin wrench, hook wrench, protection spray.